A series examining the Tools of My Trade as a Midwife. This series started with the most important tools that I have, These Hands and the most recent looked at the contents of my birth kit. Some of the tools I utilize are part of the Heart and Art of Midwifery. Other tools utilize the Science; the tools in this installment help me to interpret the science so I can support the whole client. Blood Work and Blood Pressure. The stories the body tell and share. I absolutely believe in “high touch/low tech” care and am blessed to work in a setting that, for the most part, accomplishes that goal. That being said, there are some crucial pieces of information and care that come from these tools. 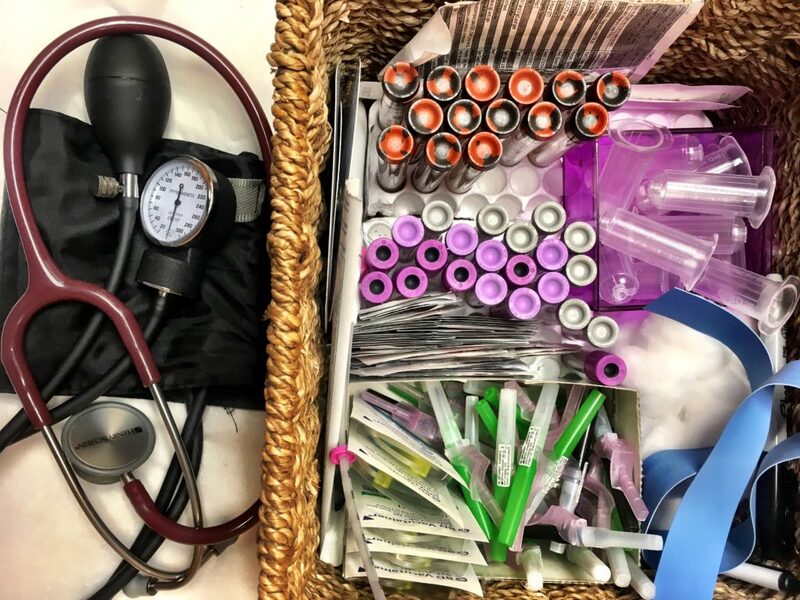 With these tubes, needles, cotton balls, cuffs and stethoscope we can get valuable insight into a piece of the whole and have a more complete, holistic picture. “Blood is the living water of our bodies, we cannot survive if our blood is not healthy. In order to grow a healthy baby, our blood must be rich and well nourished. As a midwife, it is my responsibility to understand and have knowledge about how blood functions and moves through the body. I must be able to analyze and interpret laboratory findings that look at blood. I need to know the mechanism of anemia and how it is diagnosed clinically, as well as the various types of anemia and how to differentiate them. This is crucial as the treatments vary depending on the type. Many cases of anemia are best treated through nutritional support and dietary interventions, however, some cases will need more intervention ranging from herbal treatments to IV infusions of medication. It is critical for me to recognize the difference and educate my families on their options. Utilizing these tools of science can thus help Midwives to better serve our clients. Thus is the part that intimidates me the most as a student. This is not an uncommon fear; embrace it and then take the time to walk through it. You can do it! I love this little and yet so important tidbit. Enjoy your oh so deserved mini vacation!